Gallia Academy senior linebacker Jacob Campbell brings down a Licking Valley ball carrier during a Nov. 3 Division IV, Region 15 opening round playoff contest at Alumni Stadium in Jackson, Ohio. Point Pleasant senior quarterback Cason Payne breaks away from the defense during the second half of a Class AA opening round playoff game against Mingo Central on Nov. 10 at OVB Field in Point Pleasant, W.Va.
GALLIPOLIS, Ohio — Another season of high school football. Another season of passing out accolades to the Big Blacks. Only this time, they had to share some of those major honors with the Blue Devils across the river. Point Pleasant once again dominated the selection process while landing an area-best 10 choices on the 2018 Ohio Valley Publishing Super 25 Football Team, as voted on by the sports writers for the Gallipolis Daily Tribune, Point Pleasant Register and The Daily Sentinel publications. 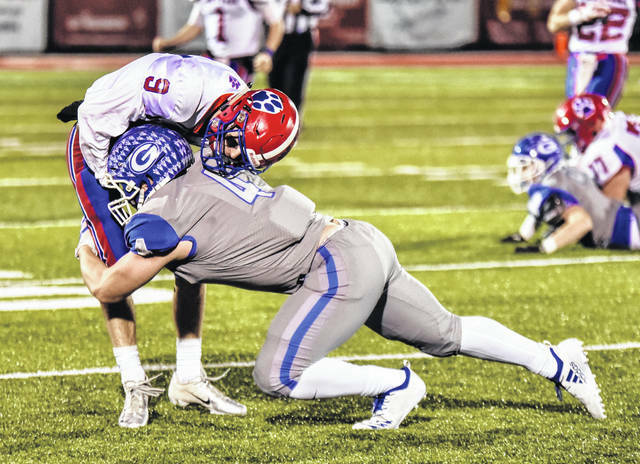 The OVP Super 25 team consists of only players on programs within Gallia, Mason and Meigs counties, and the selection process was based on overall contributions to each individual’s team — whether it be on offense, defense or special teams. This area “all-star” squad was also assembled to reward and acknowledge some of our finest local athletes for another memorable season of high school football. There were 11 offensive players and 11 defensive players chosen, as well as three all-purpose choices for players that did a little bit of everything well. No spot was reserved for a special teams player as other members of the team could be used as either a placekicker or a punter. A player of the year was chosen on each of side of the ball and a coach of the year was also honored by OVP. In all, the overall goal for the selection committee was to come away with the tri-county’s 25 best football players. There were also several good football players who did not make this list, though all were given consideration. We’ll start this list, however, with a change at the top of the coaching honors as second-year Gallia Academy frontman Alex Penrod was a unanimous selection as the area’s top coach. 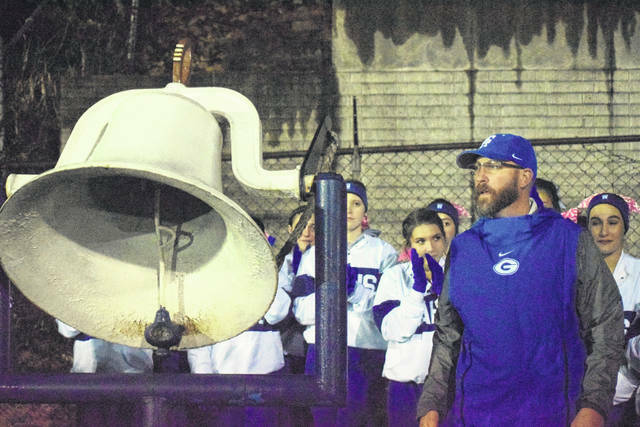 Penrod — who led GAHS to a 5-5 mark in his first season — guided the Blue Devils to the program’s first winning season, first league championship and first playoff appearance in six years, as well as going unbeaten in Ohio Valley Conference play en route to the program’s first-ever OVC championship. PPHS frontman David Darst — who guided Point to its 11th consecutive postseason appearance — had previously won coach of the year honors in each of the last three seasons, including the last two outright. The Big Blacks (9-2) and Blue Devils (9-2) were two of only three programs in the nine-team OVP area that put together a winning season — with Southern (6-4) being the other. Eastern ended up with a .500 record after posting a 5-5 mark, while Meigs (4-6) and South Gallia (3-7) came in ahead of Wahama (1-9) in the win column. Hannan was the only area team to go winless during the 2018 campaign. The selections mimicked those final records, with PPHS and the Blue Devils accounting for 17 of the 25 spots on the squad. Neither the Wildcats not the White Falcons had a player make the final cut. The Big Blacks led the way with 10 total selections, led by senior quarterback Cason Payne — who was named the area’s offensive player of the year for a third consecutive season. The 6-foot-2 southpaw accounted for just over 2,900 yards of total offense, including 1,224 rushing yards and 22 touchdowns on 125 carries. Payne also completed 150-of-218 passes for 1,688 yards, including 16 touchdowns and four interceptions. 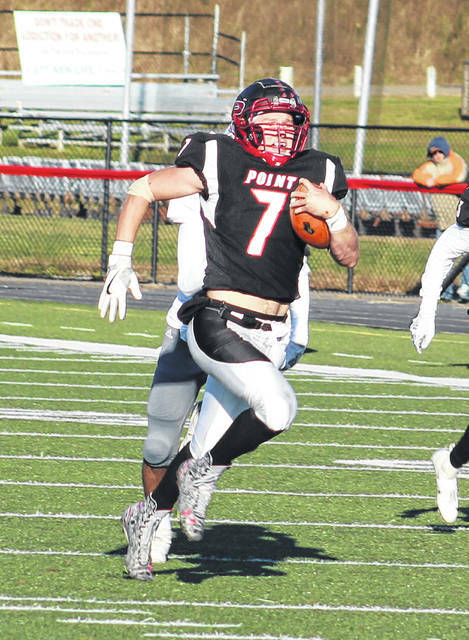 Payne — a four-year starter under center with a playoff win in each of those four seasons — leaves Point Pleasant with seven school records and 9,502 yards of total offense produced. Payne was joined on the offensive unit by five teammates, including a trio of offensive linemen in seniors Trevon Franklin and Devon Burris — as well as junior Jacob Muncy. Junior running back Brady Adkins and senior wideout Josh Wamsley were also part of the offensive team. Adkins ran for 1,091 yards and 15 touchdowns on 128 carries, while Wamsley hauled in 45 catches for 612 yards and eight scores. The Blue Devils — who set a single season record by scoring 421 points — had five players on the offensive unit, including sophomore offensive lineman Riley Starnes. Senior quarterback Justin McClelland and sophomore wideout James Armstrong were all-purpose selections on the offensive unit, while senior Lane Pullins joined Adkins at the running back position. Senior Cory Call was also chosen as a wide receiver. McClelland completed 83-of-136 passes for 1,158 yards and 10 touchdowns to go along with three interceptions. McClelland also ran 119 times for 717 yards and eight scores. Armstrong caught 29 passes for 433 yards and four touchdowns and also had 38 rushes for 359 yards and five scores. Armstrong also had 348 yards and two scores on a dozen kickoff returns. Pullins — who also averaged 34 yards per punt — rushed for 792 yards and 12 scores on 133 carries. Call caught 24 passes for 345 yards and four touchdowns. Meigs senior Zach Bartrum was selected as a wide receiver and Southern junior Trey McNickle was an all-purpose selection, while River Valley senior rounded out the offensive list in being chosen to the line. Bartrum hauled in 48 passes for 524 yards and three touchdowns, while McNickle amassed 1,012 rushing yards and 12 scores on 105 carries. McNickle also had 22 catches for 501 yards and 10 scores. For the first time in four years, the defense was not led by a Point Pleasant player … but rather by a Blue Devil. The Big Blacks, however, still had the most defensive choices with four picks. Senior linebacker Jacob Campbell was chosen as the OVP area’s defensive player of the year after accumulating 82 tackles, 15 tackles for loss and two forced fumbles. Campbell was joined on the defensive unit by teammate and fellow linebacker Cade Roberts, a junior. Juniors Nate Barth and Nick Parsons were chosen to the defensive line on behalf of PPHS, while classmates Jovone Johnson and Nick Leport were both selected to the defensive backfield. Southern senior Austin Arnold and Eastern sophomore Will Oldaker completed the defensive front, while Meigs senior Cole Adams and South Gallia junior Kyle Northup rounded out the secondary unit. Eastern senior Blaise Facemyer completed the defensive unit at the linebacker position. It was the first time in four years that the Big Blacks didn’t sweep all of the special player honors. Payne and Cody Mitchell have served as the only four offensive players of the year since the OVP Super 25 teams resumed in 2015. Tucker Mayes (2017), Grant Safford (2016) and the 2015 Point duo of Tanner Hill and Cody McDaniel were the previous honorees for defensive players of the year. Payne, Wamsley, Bartrum, McClelland, Barth, Arnold and Campbell were also chosen to the 2017 OVP Super 25 team. Excluding the coaches, the Big Blacks have had 36 players chosen for 100 spots on the OVP Super 25 teams over the last four years. The next closest area programs are Southern with 13, Gallia Academy with a dozen, Meigs with 11, and River Valley with nine.